Gone viral: the campaign has puzzled Nigerians, amid atrocities before and since. Xavier J. Peg / Flickr. Some rights reserved.The deepening security crisis in northern Nigeria and along the borders with Cameroon and Niger has galvanised more attention internationally than in Abuja. Last week, it was Britain's turn to hold a security conference on northern Nigeria. It invited an impressive group of diplomats and security experts. Many also attended the Global Summit to End Sexual Violence in Conflict, hosted by the foreign secretary, William Hague, and Angelina Jolie, a special envoy of the United Nations high commissioner for refugees. A month ago it was France which hosted the regional summit at which the Nigerian president, Goodluck Jonathan, declared “total war” on the Jama'atu Ahlus Sunnah Lidda'awati wal Jihad, widely known as Boko Haram, dubbing it the al-Qaeda of west Africa. His fellow leaders, especially Paul Biya of Cameroon, looked markedly less enthusiastic about the prospect of total war in the region. In August, the United States president, Barack Obama, will host a grand Africa summit in Washington and security will top the agenda, along with economic renewal. Jonathan has been invited to that too, despite some coded critical messages passing between Abuja and Washington. 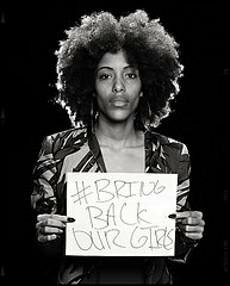 Many Nigerians have been puzzled by this intensity of international attention, triggered by Boko Haram's abduction of more than 230 schoolgirls from Chibok, in Borno state, in April. Far from being a new peak in violence by the jihadist group, it was the latest in a series of bloody attacks in the north-east. Earlier attacks had included the murder of dozens of teenage schoolchildren of both genders and serial abductions. Since the kidnapping of the Chibok girls, Boko Haram has launched a succession of attacks on villages in the area, and organised two bombs blasts in Abuja. Earlier this month, it killed hundreds more people in the Gwoza local-government area in Borno, after murdering the emir of Gwoza, Shehu Mustapha Idrisa Timta, who had publicly condemned Boko Haram. This prompted speculation that the Islamists may be seeking to take over swathes of territory. Locals say the group's black flag is flying in many villages in the Gwoza area. Taking territory would mark a huge tactical switch for a group which security experts say is about 4,000-5,000 strong and split into hundreds of quasi-autonomous fighting units, with several established bases in the Sambisa Forest, reckoned to cover an area the size of Britain, and the Mandara mountains on the Cameroon border. Boko Haram's fighting and logistical capability has increased under Abubakar Shekau's leadership. “The group is now nine parts military, one part theological, at least for this moment in the struggle,” said a Nigerian official who has had extensive contacts with its former members. Not only has the group launched a near-constant barrage of attacks on villages, and especially schools, this year; it also has the logistics to move hundreds of captive children and adults around the region in trucks, keeping them well concealed from, or at least beyond the reach of, Nigeria's military and special forces from Britain and the USA. Until now, Boko Haram's great military strength has been its mobility—able to hit and run at will, targeting military and police installations, even organising jail breaks. When the government announced emergency laws in Adamawa, Borno and Yobe states in the north-east alongside a new army onslaught a year ago, Boko Haram retreated from cities such as Maiduguri to the forest. Although it reduced operations for a few weeks, the militia quickly established a new tempo of armed raids on villages and even the military's Giwa Barracks in Maiduguri. In the short term, there would seem to be little advantage in trying to hold territory, unless it was able to take vast numbers of civilians hostage in the process. Nigerian security officials said the armed forces would see that as a red line and any Boko Haram-held territory would be attacked by air and land. These developments, regardless of international reaction, are changing political dynamics in the country. The local campaign #bringbackourgirls is led by luminaries such as Obi Ezekwesili, a former education minister and vice-president of the World Bank, and Hadiza Bala Usman, an activist from a radical northern family and former special assistant to Nasir El-Rufai. Their campaign prompted global attention as their messages and interviews flashed across social media and satellite-television stations amid multiple demonstrations in cities across Nigeria. Both Boko Haram and the government are drawing some harsh lessons from this latest development. Earlier this year, several Boko Haram fighters intensified their kidnapping and ransom operations, say government security officials. Abductions stick in the public mind far longer than even the bloodiest massacre. Many local newspapers carry a daily tally of the number of days the Chibok girls have been held hostage; one opposition newspaper simply carries “Where are our girls?” each day. The fighters see the operations, officials say, as a means to boost their profile internationally and to raise funds through ransom payments. Cameroon is known to have paid ransoms on behalf of French hostages last year; the official line from Abuja, reinforced by western diplomats, is that no ransom will be paid. Some fear that northern Nigeria could replace the Sahel as the hostage market of choice for jihadist fighters, who have earned tens of millions of dollars from kidnapping there over the past decade. However, the main concern for Jonathan's government is the group's political impact. For months, the orthodoxy in Jonathan's circle was that the group was sustained primarily by opposition politicians and their business allies, who saw it as a way to undermine the government. Tacticians in the governing People's Democratic Party (PDP) suggested that the insurgency could be turned to the government's advantage in elections due next year. The state of emergency likely to continue in Adamawa, Borno and Yobe—all opposition strongholds—makes polling difficult if not impossible. Furthermore, voters will be able to contrast the conditions in the opposition-controlled north-east with the rising wealth of the south-south and south-east states. That calculation no longer works. Boko Haram's bases may be confined to the north-east and neighbouring countries but its political effects are sweeping the nation. Whatever he may say at international conferences about the global struggle against terrorism, President Jonathan has not convinced his own people that the government has a strategy to rescue the Chibok girls or contain, let alone defeat, Boko Haram. Instead, political confidence in his government is declining and there have been ominous rumblings in the military. Some politicians in Abuja think that Jonathan won't win the PDP presidential nomination for next year's elections, while others say he won't even manage to hold on to power until the vote. The announcement this week that Diezani Allison-Madueke, the seemingly immoveable petroleum minister and close presidential ally, is to seek election as secretary general of the Organisation of Petroleum Exporting Countries was seen by oil-company executives as a sign that Jonathan is planning to throw in the towel. Even if he wanted to, it's difficult to believe that his Ijaw people, led by fiery nationalists such as Edwin Clark, would allow him to stand down. Political insiders say simply that Jonathan won't get the votes, state by state, to win the party's presidential primaries but they don't yet have a clear idea of who could. That leaves other messier options. There is much interest in the plans of the Senate president, David Mark, a veteran ally of General Ibrahim Babangida, whose coup-making days go back to the 1970s and 1980s. Mark has taken a noticeably harder line on Boko Haram than his counterparts at the top of government. He is also, we hear, outraged by the current state of the armed forces, whose soldiers say they lack basic supplies and weaponry. Should Jonathan stumble, jump or be pushed, a groundswell is building for some form of transitional government to tackle both the security crisis and the flagging morale of the military. Among the leaders mooted for such a transition is none other than Brigadier Gen (Retired) David Mark. This article is reproduced with appreciation courtesy of Africa Confidential. resolution 1325: does it make any difference?